The Recare Management Report lists the patients with and/or without recare attached and who have and/or do not have scheduled recare appointments. On the Home menu, under Reports, click (or tap) Recare Management. The Recare Management page opens. Locations - Select All to view recare types for all locations, or select specific locations to view recare types for only those locations. The report uses the location in which a given recare type was added to a patient record. It does not use the patient's preferred location, unless the patient does not have a given recare type attached, or the location of his or her recare appointment. Patients - Select whether you want to view only patients with one or more recare types attached or only patients without any recare types attached. 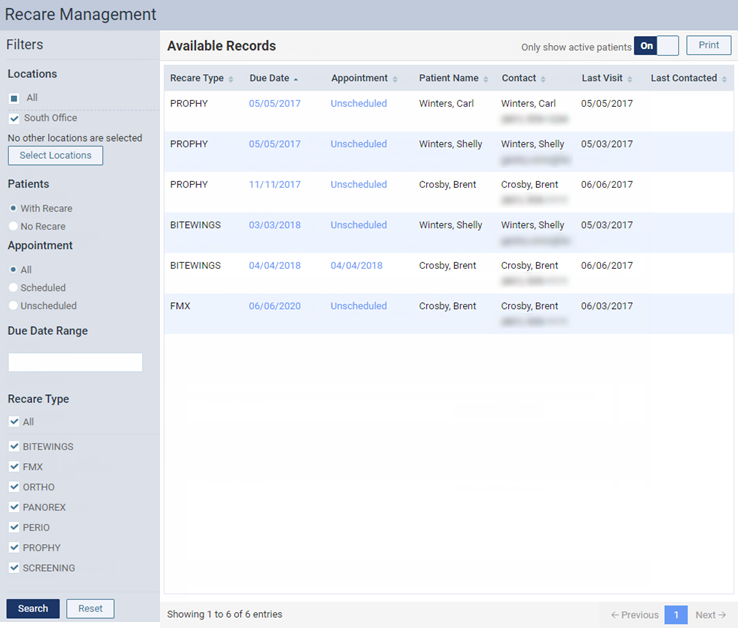 Appointment - Select whether you want to view all recare patients (with and without a scheduled recare appointment), only patients with a scheduled recare appointment, or only patients without a scheduled recare appointment. Due Date Range - Enter a date range to view only those recare patients that have a due date within the specified date range. Recare Type - Select the All check box to view patients with any recare type attached, or clear the check boxes that correspond to the recare types that you want to exclude from the report, respectively. Tip: You can group patients by family by clicking (or tapping) the Patient Name column header to sort the list by last name. You can either leave the Only show active patients filter set to On to view only active patients in the list or switch the filter to Off to view active and inactive patients in the list. If the option is set to Off, any inactive patients in the list will appear in gray text. You can click (or tap) any Due Date link to go to the corresponding patient's Recare page. You can click (or tap) any Appointment link that reads, "Unscheduled," to go the due date of the corresponding patient's recare on the schedule. You can click (or tap) any Appointment link that has a date to go the corresponding patient's appointment on the schedule.